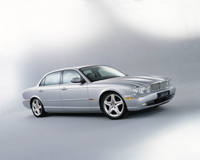 The Jaguar XJ has won the prestigious Best Luxury Car Award in the 2005 Fleet World Awards for a second consecutive year. The awards were made at a special ceremony on Thursday 19th May at the Royal Automobile Club, Pall Mall. The awards are judged by a panel of experts representing the leasing industry, fleet managers, motoring journalists, residual value guides and Fleet World’s own editorial team. The judges took a wide range of factors into account, including residual values, maintenance costs, reliability, driver appeal and manufacturer back-up. Accepting the award, Jaguar's Corporate Operations Manager James Drake-Lee commented: "We are delighted to receive this important recognition for a second consecutive year. The XJ appeals to the business driver's heart and head. Emotionally, Company Car drivers love the XJ because it combines Jaguar's traditional elegance and craftsmanship with advanced technology to provide a driving experience second to none. But the XJ is also the most rational purchase in the sector: It offers excellent value for money, great fuel economy, high residual values, reliability and, last but not least, the high-tech aluminium body delivers the lowest Company car tax bill in its class." Jaguar has also announced that the XJ range will be further extended and strengthened with the addition of a new diesel version later this year. A first for the XJ, this is another step in Jaguar's expansion of its product range. This is the second award for the Jaguar XJ this year, in January it picked up the award for Best Luxury Car' for a second consecutive year at the What Car? Car of the Year Awards. Jaguar has also achieved remarkable success in the latest J.D. Power and Associates Initial Quality Study released yesterday in the U.S. Improving to second place overall, Jaguar's success was led by its best performing model in the survey – the X-TYPE. Jaguar topped the poll as the highest-ranked European nameplate. In addition, Jaguar's Halewood plant, where the X-TYPE is manufactured, received J.D. Power's Gold Award for European plant performance.